Lakefront home with magnificent views! Multiple decks, professional landscape, mature trees, gentle running stream, tastefully decorated interiors, hardwood flrs. Fish off the dock, or jump into the pristine waters of Roamingwood Lake. Lakeviews from full kitchen, living room, dining room, soundproof TV room, large MBR, a cozy basement suite that also walks out to the lake! This property is located in a 4 star gated community called The Hideout in the heart of the Pocono mountains. The Hideout offers excellent security, 2 sandy beaches, 2 pools + a kiddie pool, boat rentals, ski hill, golf course. It's a great getaway all year-round: water activities/sports/camping/skiing/snowboarding/tubing, indoor tennis/basketball court, state of the art fitness center, excellent food & drinks at the clubhouse and lodge, an art center for children, outdoor tennis, handball, volleyball courts, baseball grounds, & for the health buffs, hills to run - all these + more within the community. Several antique and gift shops, good, affordable restaurants abound in Hamlin, Hawley and Honesdale; each less than 15 miles from the Hideout. Outlet malls (Tannersville), shopping malls, Thrift stores and the Mohegan Sun Casino (Scranton/WilkesBarre) within half hour drive. Two family beaches on Roamingwood lake. Great petting zoo (Claws 'n Paws) just 10 minutes away and a bird sanctuary. Bowling, Paint Ball, Equestrian facilities within 15 min drive. Winter sports resorts (Montage, Tanglewood, Elk Mountain, Shawnee, Big Bear, Jack Frost, Big Boulder) about an hour away. Water and Amusement Parks (Camelback Beach, Knoebles) less than 50 miles. Canoe/Kayak available on property, free of charge. Jet Ski, power boat/water craft rentals a few minutes away at Lake Wallenpaupak. Expect great memories and pure relaxation from your vacation at this home. Beautiful views all around. Most amenities provided; friendly property manager nearby to assist you. Cleaning services available for a reasonable fee. Good internet (Wi-fi), cable service available. We are eager to make your vacation most memorable! Chris and Eleanor live in the Washington, DC area much of the time. Chris attended Chaminade HS on Long Island, then the US Naval Academy. Eleanor is happy to be a home maker. Two grown children; one in New York, the other in northern Virginia. A friendly neighbor manages the rentals. This home is perfectly laid out for small groups or for a big family dinner/gathering. There's plenty to do for everyone. or, if you prefer to do nothing, find a lounging chair by the lake, under a willow tree. Located in a secure security community, worry-free, total relaxation from daily stress. Good cable and WiFi access. Very clean, linens provided. Activities abound all year round: SUMMER fun at the lake, beaches, nearby restaurants, petting zoo, horse back riding, bird sanctuary. free use of 3 kayaks/canoes on property. fish and swim off private docks! FALL foliage is spectacular! WINTER sports include cross country and the community's own ski hill. SPRING blossoms, festivals in the area. Pristine Air and water all year round! Wonderful resort-like community with 2 large swimming pools, a kiddie pool, 3 lakes, fishing, boating, water sports available. Walk to your own private docks to fish or swim. Kayaks available to use, at no extra charge. Enjoy watching boats go by. Tranquil, clean waters. Sun set view from your deck ... Very beautiful, serene, peaceful, against the backdrop of the Poconos mountains. 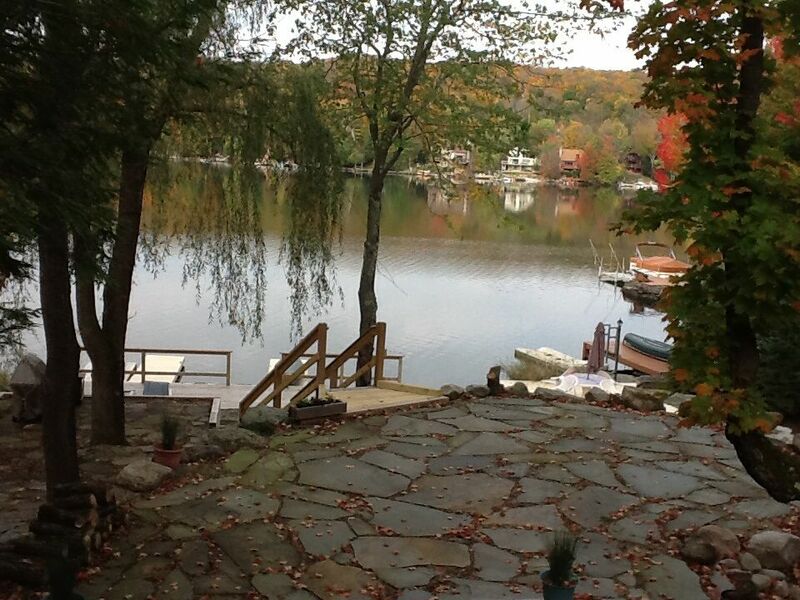 Walk out from the main floor to a wide deck overlooking the lake. Additional decking as you walk down to the lakefront. Two pools in the community, guests will have passes to both. We had such a good time at this property! We were greeted by the property manager Barbara who was very nice and helpful. The house was very clean. Kitchen was fully equipped, so all we had to bring was food. The views were breathtaking! Kids loved fishing and playing outside. Patio is big and is great for relaxing and eating outside. The community has great amnenities. There is a beach, boat rental( there are two kayaks and canoe provided at the property, but if you want to rent more kayaks or a boat, you can), recreation center, fitness center and tennis court. All are free to use. We have rented in Poconos in the past, but this is definitely the best property that we have ever stayed at. We hope to come back next summer. We spent a long weekend with our kids and grandkids at this home.Dealing with the owner and her representative, Barbara was an absolute pleasure. This home has everything you need. The grandkids went kayaking, swimming and fishing right off the pier. They also enjoyed making smores at night by the fire pit. The view of the lake is outstanding. We look forward to going back. We rented this property for 3 nights in anticipation of complete relaxation. It was a wrong assumption. Forget about relaxation during the day - you will be surrounded constantly by the noise of boats and jet ski. I am talking about - CONSTANTLY starting 8 am for 10-12 hours . Bathrooms are old and one bathroom was dirty. The owner was bothering us with little things during whole stay but what really was funny and rude - why one of our couples came in around 10 pm . It was too late in her taste. Really ? Late ? We are talking about NYC traffic that we all had on our way in . I would not recommend this property to anybody who is looking for a good Poconos stay. This guest asked for early afternoon check-in. I agreed and made arrangements with the cleaner and manager for this. However her group arrived at 7PM with an additional couple not included in the lease agreement. It's never a problem for guests to arrive late, or not at all, so I don't understand the comment about a 10pm arrival. The guest didn't leave a security deposit check upon checking in, as per our agreement; she said she wasn't aware of it. I again let her off the hook. The house was cleaned well; if there was something amiss, it may have been due to a rush cleaning job to accommodate the guest's request for an early arrival. In any event, this is the first I'd heard about one of the bathrooms not being up to par; my manager is available to address concerns like this and to call in the cleaner if needed. The furniture is more typically referred to as "antique," as many of the wardrobes and tables are 80 years old or more, made from solid wood. This was our second stay at this property and everyone (Children & Grandchildren) had a fabulous time. The property is kept in excellent condition, there are kayak's and a canoe available to use, plus life vests and other needs. Everything you need to barbecue and prepare meals is on the property. There is even a fire pit with wood to enjoy after the grandchildren are put to bed. We definitely plan on returning for our third stay next year ! Big house we had bedrooms for 7 adults and two children. Fished off a beautiful dock and also kayaks and canoes available. Great pool and beaches. Love the whole expierence. Would highly recommend. It was our pleasure to have you as guests. Thanks for taking care of our home. Myself and three other married couples enjoyed a great Memorial Day weekend here. The house was very spacious, clean and the amenities were great. The kayaks were a fun way to see the lake, and the fire wood and pit were great for roasting marshmallows. There was plenty of cookware, kitchen utensils, and plates for everyone. Eleanor and her mangers Ellie and Barbara were very nice and great to work with. An awesome relaxing, quiet weekend! Located in a secured 4 star gated community with 2 swimming pools and a kiddie pool, 3 lakes, 2 beaches on one of the lakes, plus golf course, tennis courts, rec center, good restaurants! enjoy the woods, wild animals, clean air, peaceful pace of life. A 45 min drive to outlet stores in Tannersville, a 25 min drive to major city of Scranton, within easy drive to water parks and wildlife sanctuary. Enjoy antiquing in Neighboring towns, family barbecue, pizza, chinese restaurants in the area. All these to make this a perfect vacation for all ages!! !